← Ignition part #3301-DFI, a new optional system. A slightly humorous story about “Acceptable methods of payment” for Corvair parts we offer; At Corvair College #34 in Mexico Missouri, at Zenith aircraft, 601HDS-TD builder Larry Nelson paid part of his parts bill with the 1,000 rounds of .22LR pictured below. 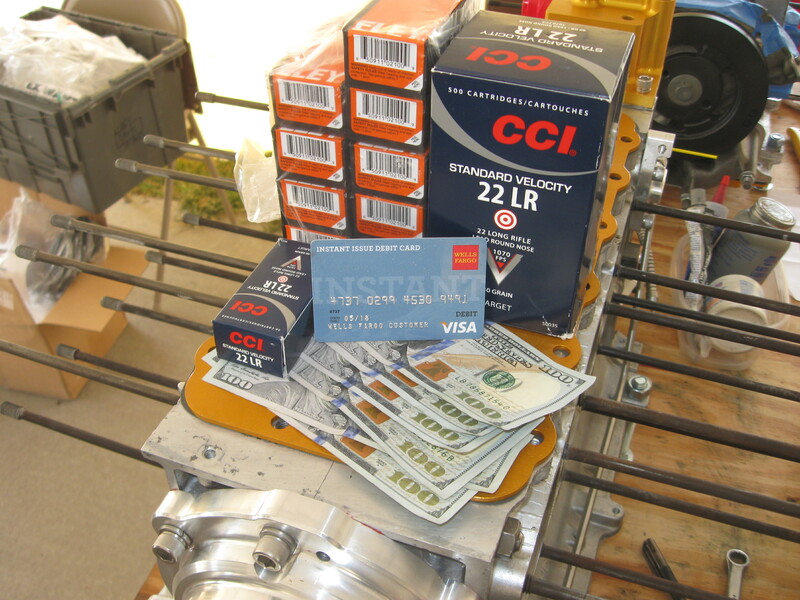 While most experimental aircraft companies accept cash, checks, Cards and pay-pal, we may be the only one that also accepts ammunition. All part of a general policy of accommodating the builders who choose the Corvair….who are often highly individual characters. Benjamins, plastic or lead? All are fine, as they all have understood value. Above, Larry Nelson’s engine on the bench at Corvair College #34. The engine is a 2700 with a Dan Weseman bearing, outfitted with all our Gold System parts from our catalog. The photo isn’t meant to offend anyone, I am just using it to illustrate the connection we have with our builders is different than most companies. I had been communicating with Larry for many years, but CC#34 was the first time we met in person. While stories I share under ‘Thought for the Day” and philosophy are not part of normal business communications, they do serve to make connections with builders that go beyond typical customer-salesman contacts. Without ever have met me in person, Larry knew that we are both involved in shooting sports, and also I would not be offended if he offered to cover part of his tab with a commodity that is understood to be a form of ‘legal tender’ in his home state of Arizona. The concept of building your own aircraft engine isn’t for everyone. The majority of people in experimental aviation opt to know next to nothing about what is inside the engine they fly behind. Conversely, Corvairs appeal to those who have a life-long desire to understand how the mechanical devices in their world work. This type of person also tends to be a bit further form ‘average’ on many fronts in their life, not just aircraft engines. Experimental aviation was developed and advanced by such people, and today we offer them an engine option, and a home among other individuals. I have most of a case of .40 caliber under the bed. Hopefully my motivation for building a corvair will be greater than my motivation to target shoot on a regular basis. If the corvair build wins out, I’ll be back in touch. Thanks for all you do and the regular emails..
Should take you about 800 yards at an average velocity of 2,400fps. All kidding aside, the first trade in we took was a builder who brought 400 rounds of .30-06 to a College and traded it for a $250 credit. I CANNOT RESIST. DOES THAT MEAN A CORVAIR IS A “BULLET PROOF” ENGINE? while we are on the topic, how can I pay for the cam kit? I do not see how to pay for it on the site. I guess my parts will be here soon? The complete Group 1100 cam kit is $400, we will have a link on the website soon, we are in the end of year process were we get caught up on all the outstanding orders, and in between tasks I write short stories like the one above, about things that happened earlier in the year. you are one of a kind–and I mean that as a huge complement. You’re lucky Grace was in there. She would have your hide. Grace owns more firearms than I do. William how much of that has been expended? Not that much, but we are getting ready to fix that, as the day after thanksgiving at our backyard range we hold the competition for who is the rimfire champion of the airpark. Just fun with plinking on our 25 yrd pistol range.